Ananda Mallorca brings you holistic yoga and fitness retreats on the island of Mallorca, Spain. Our retreats range from calming yoga and detox retreats, helping you cleanse from the inside out as you find stillness and inner strength, to more energising dynamic yoga and fitness retreats. We also offer bespoke yoga experiences. Be it for a family, group of friends, a corporate event, or a collaboration, our tailor made retreats are curated to meet our clients’ needs and dreams. In her previous life, Nadine was a business news presenter and producer for international television network CNBC. Seven years in, she decided to leave the corporate world and step out of her comfort zone. 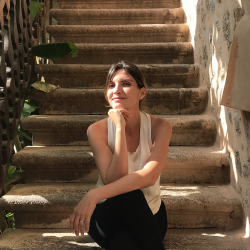 When she isn’t busy putting love and energy into organising Ananda Mallorca retreats, Nadine is a contributing writer for London-based Ethical Corporation magazine, covering environmental and human rights issues. Nadine is also a proud mum. It is her deep love and gratitude towards yoga – whilst living on the enchanting island of Mallorca – which propelled her to launch Ananda Mallorca.